A showcase of new products which are the fruits of multi-sectoral collaboration, including new designs made for international brands. Winner of TECTONA's 40th anniversary competition, in which eleven international talents are invited by the French teak furniture specialist to imagine a set of chair and table. The main idea was to play with the space between the teak battens, a key element of outdoor furniture, often use as a flooring material on balcony or as a lath. This launch collection for PROTEA, a spin-off brand of a furniture factory, is a study on mutual adaptation and understanding. The parent company was used to mass production and working against the clock while this new initiative put more emphasize on details and craftsmanship. This bench breaks the mold and add a touch of fun by rearranging the position of the legs. The soft, flowing lines also lend LEGS its particular charm. The collaboration between THINKK and QUALY, two entities with different design direction, is a very challenging process indeed. CARVER LAMP is a breakthrough where plastic object with mass-produced look is given a touch of handmade craftwork charm. Traditional chisel on wood technique is modernized to a mouse on 3D model in the computer to achieve the same carved texture feel and then made into a full production mold. The lamp comes in 2 designs: full shade and wireframe. This plant pot and saucer is designed to blend together completely, achieving a clean and elegant hill-shape look. Water can be added in the saucer to be absorbed by the plant. It comes in 2 sizes, perfect for indoor landscaping idea. As commissioned by SACICT, THINKK Studio has designed and developed the prototypes for Thai handicraft starter kits, such as woven palm-leaf carp kit, paper kite kit and natural dyeing kit. GEOLUXE® is a Pyrolithic Stone™, a man-made material which emulates the natural stone forming process. Its superior properties (low water absorption, high durability, etc.) made it a great material for this multipurpose tabletop display set. It comes in a quarter circle and a half circle shape with different heights, allowing for a variety of combination. The design comes in both GEOLUXE® and Oak version. Four legs are wrapped into one supporting column for the tabletop, freeing more space for the sitters. Perfect for small restaurants and cafés. A set of vases with same shape of bottom pieces but 3 different lid tops to pick and choose according to your flower arrangement needs. Also providing interesting aesthetic when put together. Designed to bring element of nature indoor, the PLANT STAND gives artistic touch to any regular plant pot by hiding it behind the wickerwork. 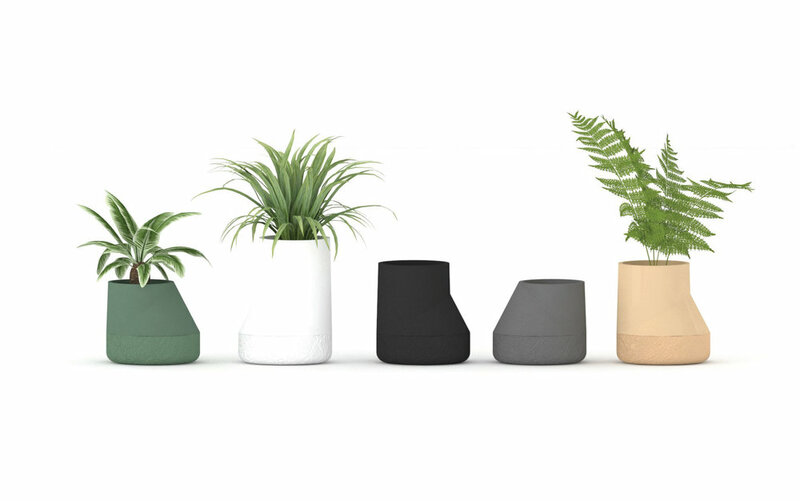 The stand itself can be flipped to change the height and style of the pot arrangement. A collaboration under BENJARONG SIGNATURE project with Ban Don Kai Dee (Benjarong Village). The local artisans are skilled in both the original Benjarong painting style and the Lai Nam Thong (gold paint) which came into popularity in the early Rattanakosin era. Here, the gold painting technique is combined with the traditional Chrysanthemum Benjarong pattern, resulting in a unique Ban Don Kai Dee design called “Grand Benjamas”. Northeastern rattan-coiling technique is coupled with woodcraft to create this artful display tray. CHANG CHANG was developed under the Thai Navatasilp: Innovative Art of Thai Crafts Project (woodcraft). Different types of wood are pieced together by expert craftsmen of Baan Tha Community, Province of Lamphun.